Without any humans in TaleSpin's world, Baloo couldn't play papa bear to Mowgli, so the show had to introduce a new child sidekick for him. A non-human child sidekick. Enter Kit Cloudkicker, a former member of the sky pirates (the series' main villain group) who gets tired of hanging out with them, steals some of their treasure, and meeting Baloo. Kit was originally going to be the son of Baloo's new boss, Rebecca Cunningham - it's pretty evident if you look at the character designs, where Kit looks more like Rebecca than her actual daughter does. Kit is also that rarest of creations, a kid-appeal character who isn't a perpetual annoyance! Like, he's brave, but not to the point of being suicidally stupid in the face of danger; he's clever and skilled, but also realistically childish; basically, he does have the usual traits of a character in adventure fiction, but balances that by acting like a normal kid. When the writers want him to. TaleSpin came out in 1990, so Rebecca Junior is wearing a backwards baseball cap as a way to show us that he's sassy and subversive. And the fact that his sweater has a patch on the elbow shows us that he's been living rough, with no adults to take care of him. So he's a loner and a rebel. [Someone better warn Dottie she doesn't want to get mixed up with a guy like him --ed.] He's got his skyboard tucked under his arm - it looks like a silver croissant, and is the reason he can jump or fall out of the show's many airborne transportation methods without dying horribly in every episode. 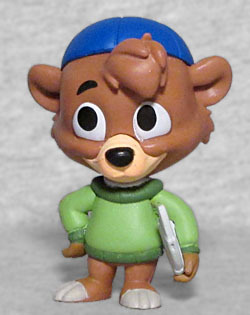 Kit is available in a 1:12 ratio, meaning he's somewhere in every case, and making him easily the most plentiful TaleSpin character in this entire series.